Linlithgow Rose kick off a new era as an East of Scotland League club this week - against some old faces from the junior ranks. Rose are in a League Cup group with other former junior sides and begin with a trip to Crossgates Primrose on Saturday. That’s followed by a visit to Sauchie next Wednesday and a home match with Penicuik the following Saturday. Boss Mark Bradley admitted it was a strange feeling: “It’s quite mad how it’s worked out. “It’s three teams we played last year, so it’s not even three different teams. Sauchie and Penicuik were in the league and we played Crossgates in one of the cups. 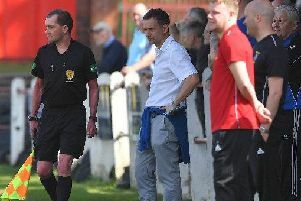 Bradley acknowledged the league season itself - which starts away to Inverkeithing Hillfield Swifts on Wednesday, August 15 - is more of a step into the unknown. He said: “I was a bit sceptical at first, but the organisation of it seems to be really good. “The quickness of the fixture list coming out I’m sure is very pleasing to everybody - players, managers, supporters and the clubs to be able to plan ahead their sponsorship and whatever else they can benefit from having a proper fixture list week by week.